This is from a study of economics PhD dissertations at one French university, the EHESS (École des hautes études en sciences sociales). 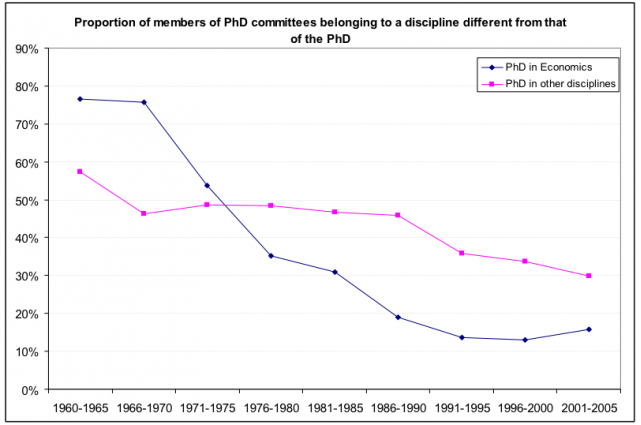 In the 1960s, three-fourths of economics PhD dissertation committee members were from another discipline, and in the 1990s, less than 15 percent. Other disciplines have also become more self-reliant, but in much less dramatic fashion. The paper, “The Mainstreaming of French Economics” by Olivier Godechot is here and the pointer goes to Art Goldhammer. The paper focuses on the transformation of the French profession led by US-trained or -oriented economists such as Jacques Mairesse, Jean-Jacques Laffont, and Robert Boyer. Godechot concludes that “scientific life in general and, moreover, paradigmatic change are not only a question of truth, of evidences, and of proofs but also of politics. Evaluating, influencing, building coalitions, voting, and selecting are regular practices both within disciplines and in wider interdisciplinary arenas when articles are submitted, grants are distributed (Lamont, 2009), positions are opened (Musselin, 2005), and candidates are selected.” Right on that. Entry filed under: - Klein -, History of Economic and Management Thought, Methods/Methodology/Theory of Science. Interesting note: Jerry Jacobs from Penn gave a talk last year on interdisciplinary research where he claimed that in survey data economists were the least likely to agree that other disciplines had something to offer. They were essentially tied with engineers in that respect as the only the only two disciplines where less than a majority agreed with that statement. Overall, I am very impressed in many ways by the modern economics profession, but the insular culture puzzles me. According to Daniel Kahnemann, economists were very open to his work with Tversky, at least as much as were his fellow psychologists. The rush into behavioral economics bespeaks considerable openness to outside perspectives. How open are cultural anthropologists to ev psych? How many social historians have economists on their dissertation committes? @srp: My experience in academia is most faculty members are fairly open to serving on the committees of other programs – economists and otherwise. I have served on a dissertation committee with an economist and I though the student benefited. However, I think the barrier comes from course work and academic reputation. Most people will ask an outside dept member to be on their committee if they’ve taken a course with a professor. So the average social historian will almost never come into contact because they don’t have the math to hack the average econ graduate course. An economists don’t do much to dispel this. I have recommended to two students in my program (soc) that they take either micro or econometrics, The instructors told them to not even bother because they couldn’t hack it, even though both students had physical science degrees. The academic reputation of economists is that they look down on most other disciplines and think a lot of the social sciences are garbage, unless they adopt the tools and methods of economics. And, honestly, who wants to approach a professor if they think that the professor thinks their whole discipline is composed of blubbering morons? If I am wrong, and economists have a deep respect for other disciplines and are willing to help dissertation students outside their area, even those working in qualitative methods, I’ll be the first to tell my students to get economists on their committee. @Fabio, continue to eschew economists from Economics Departments. They evince the attitudes you note. Especially macroeconomists, who bring nothing to any dissertation committee outside their field. Sample applied economists (and some heterodox types) in other departments, schools, centers, and institutes. I have enjoyed my service to doctoral students in BA (org theory, strategy, and marketing), sociology, geography, horticulture, veterinary medicine, and last month — philosophy! And I have placed committee members from the same list on my doctoral students’ committees. I see Steve’s point, but experimental psych and neuroscience are in a different category, because they’re “hard” science. I think Fabio correctly describes the attitude of most economists to other social sciences (let alone, heaven forbid, the humanities. Most economists would love to talk to physicists, if the latter would have anything to do with them.